HIGH The golem boss fight. LOW The game not explaining that I can pick up and place boxes. WTF The Panda costume is 2500 coins? What?! Of all the things to crib design ideas from when making a VR game, it never occurred to me that a developer would pick Captain Toad: Treasure Tracker. There’s no reason not to, of course – it’s a great game, and the miniaturized setpiece platforming works great in PSVR, which already has a solid track record of games that look like playable dioramas. I suppose it’s lucky that Light Tracer‘s developers are way more inventive than I am, because they’ve managed to re-engineer Captain Toad‘s concept into something distinctly original and wholly endearing. Players take on the role of a pair of hands whose job it is to help a willful princess climb a Babel-esque tower into the heavens. With one hand, the player aims a beam of light from a staff – the princess will always run straight towards it, even if that means falling off a cliff. Wth the other hand, players can rotate the world to get a better view of the surroundings, as well as move certain platforms and objects. The controls take some getting used to, and I spent the first world just trying to wrap my head around managing the Princess. Players have no direct control over her — they tell her where to walk, and she walks. But, they do have direct control over her jumping and sword-swinging. Getting the timing right takes some practice and I fell to my death far more frequently than I would have liked, but the checkpoints are frequent, so failure rarely proves annoying. While coming to grips with the Princess just takes a little time, the biggest problem with Light Tracer is the Move controller tracking. Without fail, after about half an hour of gameplay my hands started to drift over to the left side of the screen, eventually rendering it unplayable. The PSVR’s hand tracking could always be fixed by closing and reloading the game, but it was still a frustration. After trying the PSVR version I tried the Vive version and noticed it doesn’t suffer from any of these problems, with its tracking being rock-solid in all situations. It does have its own drawback, however – the player makes the princess move by laying their finger anywhere on the controller’s touchpad. This works well enough normally, but problems start if the player tries to jump, which is accomplished by pushing on the same touchpad. This makes it nearly impossible to jump without moving, which can lead to some unfortunate accidental plummeting off of pathways. There’s an alternate button for jumping, which makes the game playable, but it’s just not as convenient as the Move controller’s face buttons. 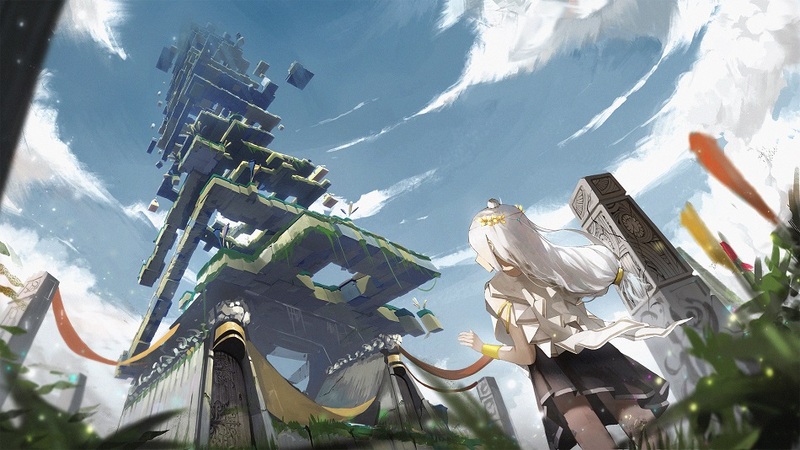 Light Tracer‘s visuals deserve special mention for their excellence in building with an interesting and consistent aesthetic. Everything is blocky and jaggy, built out of hard geometric corners. As the tower spirals up into the sky, new block types appear, along with new enemies and traps, but they all fit together beautifully. Commendations also go out to Light Tracer for its perfectly-sloped difficulty. The first world is all about teaching players the controls. 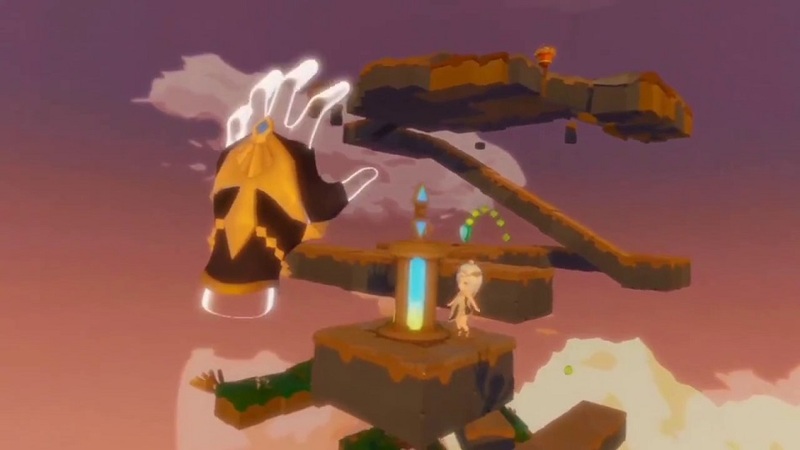 The second introduces jumping and puzzle mechanics, and the third layers in combat. From there things get increasingly challenging until the last world is built around expertly testing everything players have learned. It’s one of those special games where the training feels like play, and passing the final feels like a truly rewarding accomplishment. Disclosures: This game is developed by Void Dimensions and published by Oasis Games. It is currently available on PSVR and Steam VR. This copy of the game was obtained via publisher and reviewed on the PSVR. Approximately 7 hours of play were devoted to the single-player mode, and the game was completed. There are no multiplayer modes. Parents: According to the ESRB, this game is rated E and contains Mild Fantasy Violence. There are a few types of cute creatures that the princess has to slay with a sword, but it’s all bloodless and harmless. The princess will get whomped by traps and fall into abysses on the regular, but she always jumps back to her feet at the checkpoint with a cheerful cry. It’s safe for anyone. Deaf & Hard of Hearing Gamers: I played most of the game with no audio and noticed no difficulties. However, there are no subtitles for the Princess’ dialogue.